Dubai, United Arab Emirates, 4 February 2019: Arabian Automobiles Company, the flagship company of the AW Rostamani Group and the exclusive dealer for Renault in Dubai, Sharjah and the Northern Emirates, rewarded Pruthvi C.R. 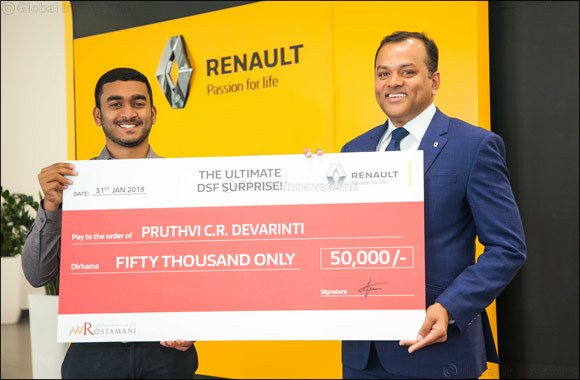 Devarinti, with an instant cash prize of AED50,000, when he purchased a new Renault Duster, as part of the Renault Dubai Shopping Festival promotion. Arabian Automobiles is offering instant cash rewards to all Renault customers as part of the campaign with the grand prize being AED50,000, presented every week to one customer. Others stand to win cash prizes starting from AED2,000. With just a scratch and win card, every new Renault customer at Arabian Automobiles goes driving with the additional bonus of instant cash prizes. Arabian Automobiles is a strategic partner of DSF since its inception, and with the Renault campaign, it offers customers the perfect reason to purchase an all-new Renault that is popular among families. Visit your nearest Arabian Automobiles showroom to learn more about the new line-up for 2019 from Renault and to purchase your new car and be rewarded instantly.